Can you believe it is almost the end of winter with spring only one more sleep away!! Just makes you want to get out and explore, be inspired and create! However, my dose of reality checking reminded me I had an assignment to submit today, so I've spent the last week studying as hard as I could (minus the numerous moments of distraction!). But a big Hooray! I got my assignment finished on time and it's given me a couple of hours to finish my double scrap layout (that I started at our last Scrap night) and finish addressing all those invites for my WH's 40th birthday. Only a small window before I have to go and pick up the kids and think about dinner!! Absolutely and positively Inspired by this lovely layout I saw on the Flutterbyes and Fireflies blogspot (click here for the layout and a chance for blog candy), I thought to myself, I could do something with this. 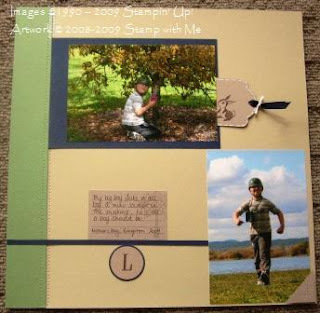 I find scrapbooking so hard, but with the layout in mind, these pictures of my Big Boy Luke, some army camouflage colours, I knew I might just be able to put it together! Here they are! Other: Circle Punches, paper piercing tools, white gel pen, crochet thread, navy grosgrain ribbon, cutters & Stampin' Dimensionals. Tag punch from Creative Memories. You might notice some of the tags are "hidden" behind the photos. I asked my son to write his name and a few other things. I can now treasure the memory of the beautifully innocent, but oh so special, handwriting of a 6 year old, who made it special for his mum! Hi! 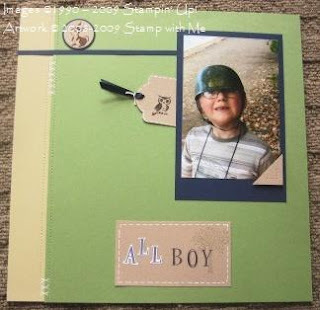 Love this layout and your "army colours"! So neat to see that someone liked my layout enough to case it. Your pages really rock! Thank you so much!! I couldn't have done it without you! !